Announced at this year’s WWDC, the 2012 “Retina” MacBook Pro is the latest addition to Apple’s laptop marquee. While the standard MacBook Pro received more minor updates, the 15.4″ Retina MacBook Pro received a complete overhaul in both design and specifications. The 2012 Retina MacBook Pro is both thinner and lighter than predecessors, with the overall thickness reduced from 24mm to just 18mm. The Retina MacBook weighs in at just 4.46 pounds (2kg), a full 1.2 pounds lighter than the standard 15-inch MacBook Pro. Much of the weight and size reduction in the 2012 Retina MacBook Pro was achieved by utilizing flash storage and removing the optical drive. As a consequence, if you plan on using DVDs or CDs, you’ll need to purchase an external drive. Externally, the Retina MacBook Pro features two USB 3.0 ports, two Thunderbolt ports, a HDMI port, SDXC card slot and a single audio out. With a total of 5.1 million pixels and a resolution of 2800 x 1800, the “retina” display on the 2012 MacBook Pro is the most noticeable of the new upgrades and has been the focus of Apple marketing thus far. The improvement in the display is as big a jump in quality as there was from the iPhone 3G to the iPhone 4, which featured Apple’s first retina-level resolution. Photos, videos, games all look amazing on the new display, which has both improved viewing angles and a 29% improvement in contrast ratios for whiter whites and blacker blacks. 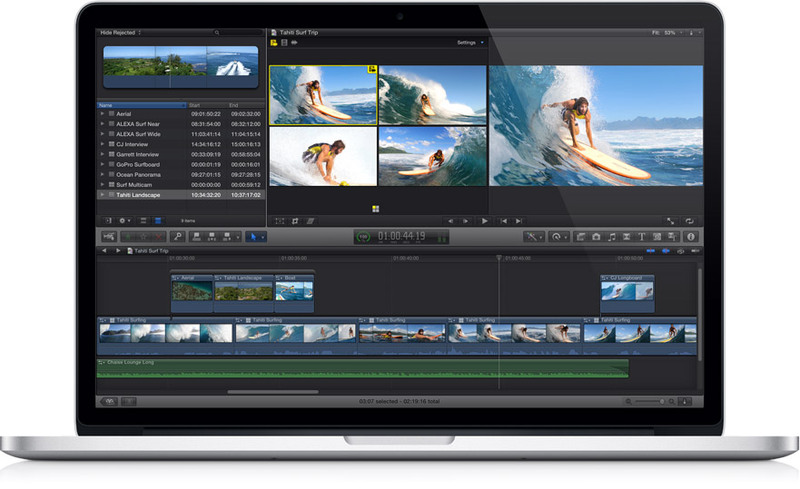 Apple have upgraded the resolution of many native apps such as Safari, Mail, iPhoto and iMovie to improve aesthetics and compatibility with the new Retina MacBook, however it will take some time before many 3rd party apps make the necessary updates – meaning that many programs will be forced to run at a lower resolution. 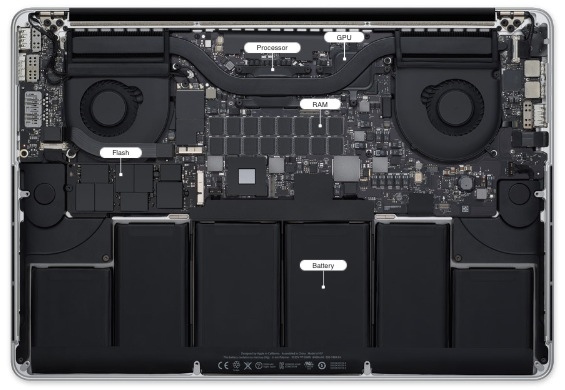 The third generation of Intel’s Quad-core i7 “Ivy Bridge” processors are at the heart of the new Retina MacBook Pro, offering speeds up to 2.6Ghz with 6MB shared L3 cache, providing significant performance improvements over previous models. All-flash architecture has done away with a traditional spinning disc hard-drive, and the base model (2.3GHz) 15″ Retina MacBook Pro comes with 256 GB of flash storage, configurable up to 768 GB in the 2.6GHz model. As expected, the Retina MacBook Pro comes loaded with the capable NVIDIA GeForce GT 650 M graphics card, enabling dual display and video mirroring with up to 2560 x 1600 on up to 2 external displays. External displays can be connected via the Thunderbolt connection, or through the appropriate DVI or VGA adapters which are available separately. An upgraded battery manages to power the new high-resolution display for up to 7 hours of web browsing, or up to 30 days of standby time. The latest 802.11n Wi-Fi and Bluetooth 4.0 provide connectivity options, and a 720p FaceTime camera allows for HD video chat with friends and family. The 2012 Retina MacBook Pro is available now, with prices starting at $2199 for the 2.3GHz model and $2799 for the 2.6Ghz model.